Frantz Company distributes a full line of dried, granulated corncobs. Our corncob products are packaged in fifty-pound bags and dried to a moisture content of 8%. Both are processes where the abrasive and absorbent characteristics of corncob are desirable. Corncob grit simultaneously polishes and deburs parts while cleaning and drying them. Oils and other liquids from wet mass finishing process are also absorbed. Grade selection is typically determined by the desired finished surface profile and the diameter of any holes or cavities in the part. The selected grade should not contain particles that would lodge in part openings. Corncob grit blasting is done with the same equipment used for sand blasting. Because corncob is less aggressive than sand, it's sometimes characterized as a "soft abrasive." Corncob grit does not etch glass or foul bearings. It is often used to clean electric motors and machinery with hydraulic cylinders. Other applications include: smoke damage and residue clean up, mold cleaning, loose/flaking paint removal. 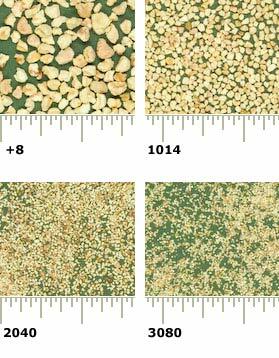 Unraveling the mystery of the grades is easy, the larger particle sized grades are on top and each successive grade is smaller. Particles are sized using U.S. Standard Sieves/Screens.